Being a teenage superhero can be confusing. 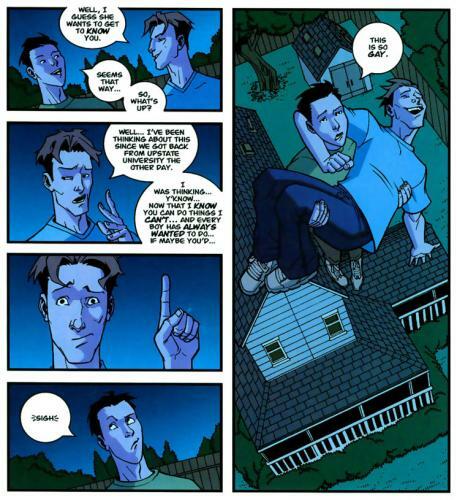 Invincible is published by Image Comics and is a good read. Yeah, i’ve read couple of ’em… really good spin on superheroes. Now if only the art didn’t blow. oh dude. the art is awesome. Maybe…they’re wearing different shoes? Maybe? Why is Keanu Reeves taking Conan O’Brien flying? I believe his shoes look pointy from perspective- his feet are pointed downwards in flight.